Whether one agrees with the claim that game writing is generally bad or not, I think it is hard to argue that the Odyssey conversation is good. It has lots of clunky references to a shared past, to where the player needs to go next, and some dialogue choices that just don’t make a lot of sense. 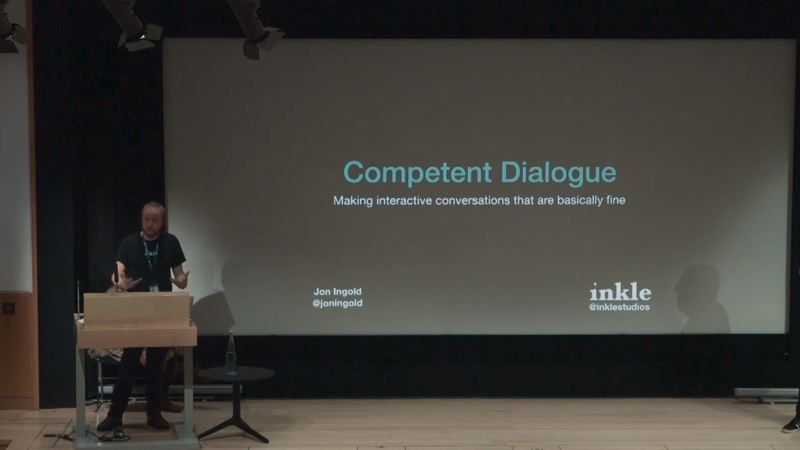 The demonstration that Ingold makes over the course of about 45 minutes is centered on rethinking how video game conversations work. To do this, Ingold looks to the first scene between Rachel and Deckard in Blade Runner in order to reverse engineer what that scene is about and how it works so that he can then implement that back into the interactive dialogue of games. To Ingold’s reading, the scene is fundamentally about the cop Deckard trying to boss around some rich folks who resoundingly defeat him, first through Rachel’s wit and then through Tyrell’s steamrolling. In this way, the scene is really about an attack that is defeated, and it’s all happening in the dialogue. To rewrite the Blade Runner conversation in game form, then, is to take the structure of that “attack” and then change the way that it is presented to the player. Ingold’s talk is about demonstrating how that works, and for the nitty gritty of it you probably just need to watch and listen to it from the 19:00 point forward. After watching the entire presentation, I certainly gained an appreciation for Ingold’s technique, which largely revolves around making players understand where they are in a conversation. He advocates for using loops of dialogue, but not simply in a kind of “click on all the dialogue way.” Instead, Ingold shows that you can tactically reset dialogue progress as a way of signaling the power of NPCs or the fact that a player has made a mistake. The entire lecture is a fascinating glimpse into the methods of someone who is trying to push game writing in a particular way. I’d certainly like to play a few more games that use his techniques.